PRIVATE LAND HUNTS - We offer elk and antelope hunts on the Montosa Ranch, a 32,000 acre privately owned and operated ranch nestled in the heart of New Mexico. We only conduct a limited number of hunts each year to ensure a quality experience. NM private land hunts do not require a hunter to go through the lottery draw process. We can guarantee a landowner tag for each species. All trophy hunts are fully guided and accommodated. The lodge has central heat and air and consists of four bedrooms, four bathrooms, kitchen, and a hunters den. It comes complete with all the necessities to make your stay comfortable and enjoyable. PRIVATE LAND ELK HUNTS - Our private land is located in a unit that only allows archery and muzzle loader hunting for Elk. We offer 10 archery bull elk hunts, 2 trophy youth muzzle loader hunts, 8 trophy muzzle loader bull elk hunts. Availablity of Late season bull elk hunts varies from year to year. Hunts are based on the quantity and quality of bulls residing on the ranch in November and December. The archery hunt is split into three hunts, September 8th-13th, September 15th-19th and September 20th-24th. 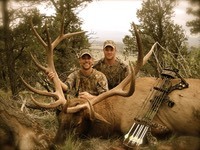 The trophy muzzle loader hunts are conducted early to mid October depending on NM regulations. Late season hunts take place November thru December. Please contact me for more information and availability of hunts. MORE INFORMATION - Fully Outfitted hunts include: Accommodations that vary from hunt to hunt. Most of our camps are home settings with separate bedrooms, bathrooms and showers, beds with mattresses along with washer and dryer facilities. If necessary we will set up travel trailers that will provide most of the comforts of home. We provide all meals and transportation during the hunt. We also field dress, skin, cape, and deliver your elk to the nearest processing facility. The hunter is responsible for processing, wrapping, freezing and shipping (if necessary). Please let us know if you have special dietary requirements or medical consideration we should be aware of. Licensing: The hunter is responsible for all state licensing fees and all hunts are conducted in strict compliance with the laws and regulations of the State of New Mexico. Equipment: The hunter shall provide personal transportation to hunting headquarters, unless other arrangements have been agreed to by all parties. Hunter is responsible for a weapon, ammunition and all personal articles. Hunters Responsibility: The hunter is solely responsible for his/her physical condition. Hunts take place in rough terrain at altitudes above 6,500 ft.! If the hunter has any doubts about his/her ability to withstand strenuous activity at high altitude, he/she should consult a doctor. The hunter represents that he/she is responsible for any and all hunting hazards.